President Barack Obama formally endorsed presumptive Democratic presidential nominee Hillary Clinton after meeting Thursday with her rival, Bernie Sanders, in a bid to unite the party and defeat controversial Republican Donald Trump. 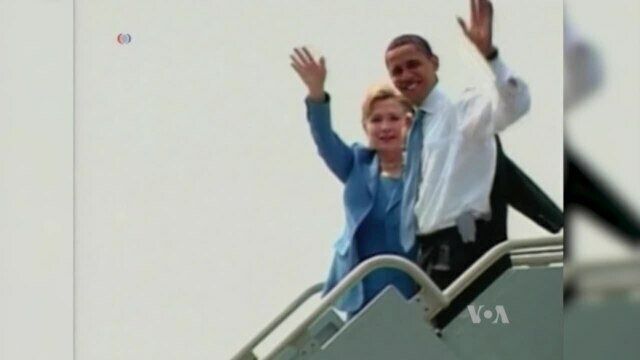 In videotaped remarks released by the Clinton campaign, Obama said he knows how difficult it is to be president, and that is why he knows his former secretary of state is capable of doing the job. The White House said Obama would campaign with Clinton for the first time during an appearance in Wisconsin on Wednesday. Obama carried that state in both general elections when he ran for president. “I am with her. I am fired up and I cannot wait to get out there and campaign for Hillary,” the president said. The official endorsement came after Obama held a one-hour Oval Office meeting with Sanders, the impassioned Vermont senator who has won the support of millions of people, especially younger voters. His speeches demanding income equality and an end to the strong influence of wealthy donors and special interests in Washington have helped energize supporters. After the meeting, Sanders stopped short of conceding the nomination to Clinton, but said he would meet with her soon and do everything possible to help prevent Trump, the Republicans' presumptive nominee, from winning the White House. Trump’s own party leaders have disavowed his rhetoric against Mexicans, Muslims, women and other groups. But most have continued to back him. 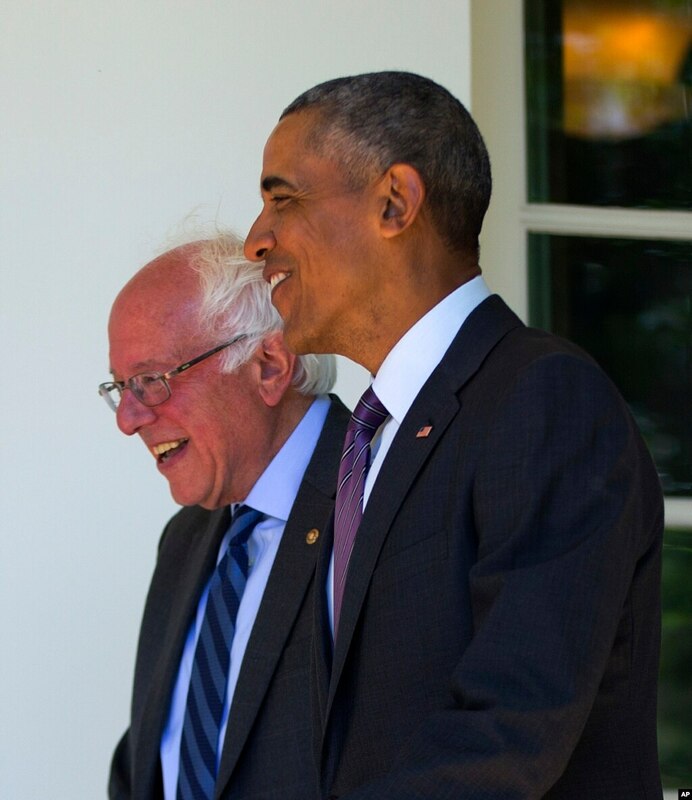 President Barack Obama walks with Democratic presidential candidate Sen. Bernie Sanders of Vermont down the Colonnade of the White House in Washington, June 9, 2016. "The American people will not vote for or tolerate a candidate who insults Mexicans and Latinos; who insults Muslims; who insults African-Americans and women,” Sanders told reporters at the White House. “I will do everything in my power, and I will work as hard as I can, to make sure that Donald Trump does not become president of the United States." Sanders said he would compete in a primary in Washington, D.C., on Tuesday and would continue to push issues central to his campaign until the Democratic convention in July. The senator said his campaign has been about “building a movement” to create a government that represents all Americans, not just the wealthiest. “We will continue doing everything that we can to oppose the drift that currently exists, to oppose an oligarchical form of society where a handful of billionaires exercise enormous power over our political and economic and media life,” he said. Democratic leaders said Sanders and his supporters are critical to ensuring a victory for Clinton. White House press secretary Josh Earnest said Obama and Sanders had a “friendly” meeting and discussed the possibility of working together in the future on ways to energize and engage younger voters. He also pointed out that overall, the Democratic Party is united in its key priorities and principles. William Galston, a political scholar at the Brookings Institution in Washington, said both Clinton and Sanders have a responsibility to bring the party together. “Mr. Sanders, if he is serious in saying, as he has frequently, that the differences between him and Secretary Clinton pale into insignificance in comparison to the differences between the two of them and Donald Trump, then he will do everything in his power to bring the party back together,” Galston said.